Since making her debut at the Opéra de Paris, Nadine Denize has become one of the most prominent exponents of the French lyric repertoire all over the world. Her roles include many of the major dramatic mezzo soprano roles, such as Charlotte WERTHER (with Alfredo Kraus and Georges Prêtre at la Scala), Cassandre LES TROYENS (La Scala with Georges Prêtre, Chicago with James Levine) and Didon in the same piece at the Berlioz Festival in Saint Etienne under Serge Baudo. 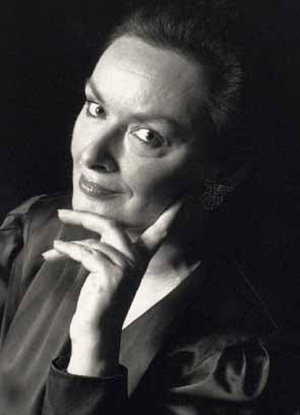 She has also appeared in CARMEN (Arena di Verona, Paris, Toronto, Hamburg, Santiago Chile), LA DAMNATION DE FAUST (Spoleto Italy, Berlin), SAMSON ET DALILA and DIALOGUES DES CARMELITES (Mère Marie in Paris and Toronto, La Première Prieure in Savonlinna and London), PELLEAS ET MELISANDE (recording with Herbert von Karajan, Paris, Salzburg, Scala with Prêtre) and LOUISE (Marseille, Strasbourg). She sang the major roles of the Italian repertoire with great success, particularly Eboli DON CARLO with Mirella Freni and Nicolai Ghiaurov under Claudio Abbado at la Scala, in Vienna and Berlin (among others), Santuzza CAVALLERIA RUSTICANA (Strasbourg, Düssseldorf), Federica LUISA MILLER (Paris with Luciano Pavarotti and Katia Ricciarelli), Neris MEDEA with Leonie Rysanek in Aix-en-Provence, with Shirley Verrett in Paris under Pinchas Steinberg, just to name a few. However, the German repertoire has also occupied a significant place in Nadine Denize’s career. She was a remarkable Kundry PARSIFAL at the Opéra de Paris under Horst Stein with Jon Vickers, sang Venus TANNHÄUSER (Berlin, Bonn), Brangäne TRISTAN UND ISOLDE (Berlin, Paris, Chicago, under Ferdinand Leitner for the last Tristan of Jon Vickers, Monte Carlo, Maggio Fiorentino), Fricka RHEINGOLD (Vienna, Münich, Paris, Chorégies d’Orange under Rudolf Kempe) and DIE WALKÜRE (Geneva, Münich with Wolfgang Sawallisch, San Francisco with Birgit Nilsson, Leonie Rysanek and Jess Thomas), Ortrud LOHENGRIN (Marseille, Lyon, Strasbourg), Waltraute GÖTTERDÄMMERUNG (at Radio France with Giuseppe Patané), Octavian DER ROSENKAVALIER (Strasbourg, Vienna), Die Amme DIE FRAU OHNE SCHATTEN (Geneva), Herodias SALOME (Festival de Radio France in Montpellier, Leipzig), Henze L’ULUPA (Lyon) and The Mother HÄNSEL UND GRETEL (Geneva, Leipzig)..
Nadine Denize has also appeared in several important roles of the Russian and Czeck repertoire such as Larina EUGEN ONEGIN, Countess PIKOVAYA DAMA, Kostelnicka JENUFA and Kabanicha KATYA KABANOVA (Geneva with Jiri Belohlavec). Miss Denize is regularly present on the concert platform, where she sings with the most prestigious orchestras all over the world. She has performed works such as Beethoven MISSA SOLEMNIS, the major works of Berlioz, Berg SIEBEN FHÜHE LIEDER, Duruflé REQUIEM, Chausson LE POEME DE L’AMOUR ET DE LA MER, Mahler Symphonies and Cycles; Ravel SHEHERAZADE, Schönberg GURRELIEDER, Stravinsky LES NOCES and LE ROSSIGNOL and Wagner WESENDONCK LIEDER. She has performed under the baton of the world’s great conductors including Gerd Albrecht, Karl Böhm, Pierre Boulez, Myung Whun Chung, Colin Davis, Sylvain Cambreling, Christoph von Dohnanyi, Eliahu Inbal, Armin Jordan, Marek Janowski, Alain Lombard, Seiji Ozawa, Lorin Maazel, Charles Mackerras, Michel Plasson, Mstislav Rostropovitch, Sir Georg Solti, Yuri Temirkanov and Karl Tennstedt. She has also participated in numerous recordings. Miss Denize has appeared as Klytämnestra ELEKTRA at the Opéra de Nantes, as well as appearing at La Scala Milan in PELLEAS ET MELISANDE.